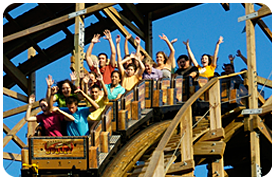 You'll be sweatin' bullets when you ride this one of a kind wooden rollercoaster! 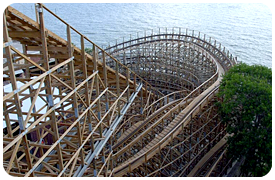 The Boardwalk Bullet has the most number of track crossovers ever designed into a wooden coaster – 42 total! That's a lot considering how compact and twisted this coaster is! Extra individual ticket purchase not necessary if All Day All Ride Pass is purchased. Guests must be 48" tall to ride. The Boardwalk Bullet opens when all amusements open for business. Schedule is weather permitting. Sometimes the Bullet needs some maintenance – we always apologize for any inconvenience this may cause but with such a high-powered crazy coaster – you can understand! We will always try keep you posted on our site and on Facebook! If there is ever a question, please call us at 281-535-8100. All other Rules & Regulations are posted on location.